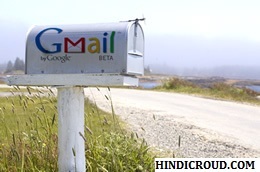 Home Gmail Gmail Email kya hain ? Aur Gmail ka Use kaha Par hain ? Gmail Email kya hain ? Aur Gmail ka Use kaha Par hain ? Gmail Email Service ke bare me batane se pahle main apko batata hu ki akhir Email kya hain ? E-Mail(Electronic mail)-Dosto Email service ek mail service hai jiski help se hum apne Messages,Images,files ko kisi dusre Vyakti ke pass bhejte hain. Gmail Google ki free Web based email service hain.Aap free of cost ish service ka use kar sakte hain.Gmail service 1 April 2004 ko launch hui thi.Gmail Email service mein 72 languages me available hai.Feburary 2016 tak ki report ke Anusar Gmail service par 1 billion se bhi jyada users register ho gaye the.Gmail service 'Paul Buchheit' ne develop ki thi.Gmail ek secure webmail email service hain.Jab ye service launch hui thi tab iska storage 1 GB tha.Storage updatation niche diya hua hain. Gmail Email kya hain ? Aur Gmail ka use kaha kaha hain ? April 2016 mein Gmail service ki ALEXA RANK 89 thi. ( Dosto Alexa ek website hai jis par kisi bhi Website ki World wide Rank pata lagti hai).Gmail Email ko access karne ke liye apko Email id and password ki bhi jarurat hoti hain agar aapke pass nahi hain to niche jo link hai ush par click karo.Aap isko google ki kisi bhi service par use kar sakte hain. Read-Gmail par Account Kaise banaye free mein? 1.YOUTUBE:-Youtube Google ki service hain.Aap Gmail account ki login id aur password ki help se free of cost Youtube par apna account bana sakte hain.YouTube par aap free of cost video upload kar sakte hai aur World ke samne share kar sakte hain.Video online dekh sakte hain.Youtube service May 2005 me launch hui thi,Youtube ka Head office San Bruno,California(United States) me hain.July 2016 me Youtube ki ALEXA RANK 2 thi.YouTube account ko adsense se attach karke aap achha paisa bhi kama sakte hain. Read-Youtube par Account Banakar Paise Kaise Kamaye? 2.GOOGLE PLUS-Google Plus bhi Google ki Social network service hai jo Gmail email id aur password se access hoti hain jis par aap Friends ko apne circle me add kar sakte hain,images upload kar sakte ko ,Community bana sakte ho Community usi tarike se hain jaise Facebook par Group hota hain.Aap apna official Business page bana sakte hain.Google plus service 15 December 2011 ko launch hui thi.Google plus service par 111 million active users hain. 3.GOOGLE ADSENSE-Google Adsense Google ka Program hain.Google Adsense April 2003 mein launch hua tha.Google Adsense ek Bahut hi important Advertising program hai jo Google id(Gmail id) aur password se access hota hai.Google adsense ki help se Blogger,Youtubers,websiters etc. achha paisa kama lete hain.Google Adsense ko Publisher Advertise ka paisa deta hain aur jo Blog ya website Google Adsense se attach hote Google Adsense un Blog ya website par AD show karta hain isse blog ya website ko bhi benefit hota hai kyuki Usko bhi rupees milti hai.Google Adsense unhi blog ya Websites ya Youtube channel par AD show karta hain jo Google Adsense ke Through Approved hote hain.Mai ab batata hu apko paise kaise milte hain Suppose kijiye Dosto apke paas ek Google Adsense Approved Youtube Channel hai.Kisi publisher ne Google Adsense ko 3 Doller apni AD ko 1000 bar show karne ke liye ab agar apke channel videos par AD show hogi 1000 baar.Ab 3 Doller me se 1.2 Doller rupees Youtube le leta hain aur baki ka 1.8 Doller apko De deta hain.Aap Google Adsense ko is tarah se samanjh sakte hain ki ye Publisher aur Advertiser ke beech ka link. Read-Google Adsense se Paisa Kaise Kamaye? etc. mail services hai par dosto ek baat yaad rakhe agar aap gmail ke alava koi aur mail service use karte ho to aap Google Programs ka use nahi kar sakte ye Google id(Gmail Id) and password ye hi access hogi. Read-Free Website kaise banaye Blogspot par?